Well, one way of doing it anyway. For a few years I have been friendly with Matt and Fanos at Big Smoke Media, a south-east-based marketing company who specialise in distributing postcards across the London area. When you are next in a bar, cinema or restaurant, keep an eye out for a postcard rack promoting new films and exhibitions. These are Big Smoke’s. 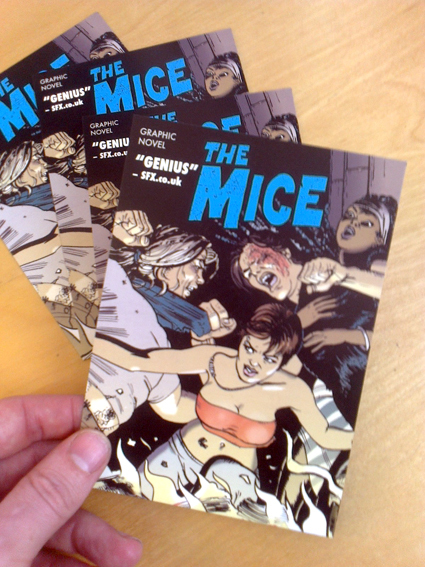 Postcard promoting the new Mice graphic novel, Culture Shock. Design by Roger Mason. Across London, and further afield I hope, are postcards like the one above, for all to pick up and take away. I have a box of them to distribute myself so these are placed at my studio in Dalston, which sees quite a footfall thanks in part due to Dalston Roof Park, as well as the sheer number of people who either work at or visit the Bootstrap Building each day. 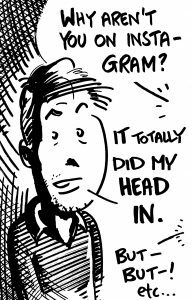 I am also placing them at SAE Institute on Kingsland Road, Hackney where I teach drawing skills to 3D animation and film students. Some have been placed on tube trains and last week I went to central London and placed them in comic shops Gosh! and Orbital, and bookshops Foyles and Waterstones. The latter were unexpectedly open to the idea, which tells you more about my prejudices than theirs. 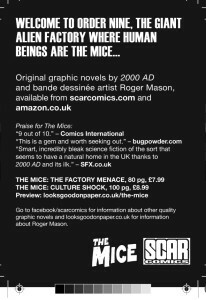 Copy on the postcard promoting the Mice graphic novel Culture Shock. Design by Roger Mason. The postcard has been well-received. I am wondering whether it matters that both of Diana’s hands are cut off and whether Harry (left) resembles a well-built woman. Whoops, left it a bit too long since my last post, what with the Christmas period and taking time off. 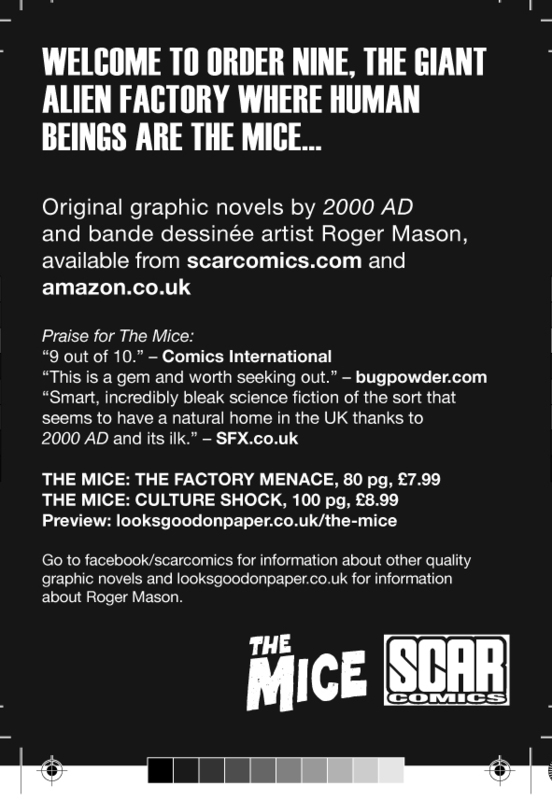 I also wanted to leave the advert for The Mice book at the top of the pile as well. Moving on into 2012, appropriately enough here’s an image I produced last summer. From time to time I work for Big Smoke Media, who are a London-based promotional company who create and stock the postcards that you find in a rack in restaurants, bars and cinemas in the South East, often while on the way to the loo. It’s been great to know them and they have been kind enough to pay me with my own distributed postcard when I do an illustration for them. 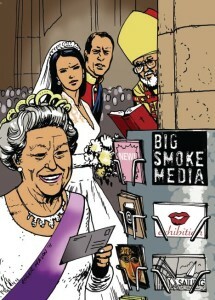 This is one for them, a take on the royal wedding. The postcard I had made subsequently featured the grinning soldier you will have seen at the top of this blog and I hope that if you have been in the city you may have seen either of them and taken one.